Aside from the pre-installed SMD microcontroller, all the IchigoJam’s components are through-hole. The sockets are a micro-USB for power, a USB-A for keyboard, and a phono for video, otherwise aside from a few passives there is a crystal, a regulator, an LED and a power switch. There is also a small piezoelectric speaker, though this is intended to be plugged directly into the device’s I/O lines. Unexpectedly a DIP socket is included for the processor, no doubt a BoM hangover from the days when a DIP processor could be supplied (ARM DIP packages are no more). Seemingly this is used in the standard build as a carrier for a sticker bearing pin assignments. The English assembly instructions Jim had sourced with the kit were pretty sparse, but fortunately this is in no way a challenging kit to assemble. Resistor values are clearly marked upon the board, capacitors are easy enough to identify, and every other component has an obvious board outline into which it fits. It took me a leisurely quarter hour to build, achieving a tidy result. My tiny portable CRT TV is a UK-market 625-line model so wouldn’t sync to the IchigoJam’s monochrome 525-line video when I powered it up, but every flat-panel TV I tried it with had no problems. I was greeted with a copyright message and a BASIC interpreter prompt, the little board was working. Some simple BASIC to get things started. A teenage me fresh from a Sinclair Spectrum would have gone straight for the IchigoJam’s graphics and sound capabilities, but of more use for Hackaday in 2019 was the LED keyword suggested as a hardware test by the documentation. In no time I was able to flash the onboard LED, and my IchigoJam hardware odyssey had begun. So the IchigoJam can do most of what I could do on my 8-bit home computer back in 1983. The question is then, what can it do that the Spectrum, Commodore 64 and their ilk couldn’t? The most obvious place to start would be with the board’s interface sockets, but before we go down that road it’s worth taking a diversion. A part of 8-bit computing that many people will remember was the use of audio cassettes to store software. The IchigoJam eschews that but doesn’t lack storage, instead it can store code in its internal Flash memory. It can store up to four programs on board, and there is reference to an external EEPROM board probably using the LPC1114’s I²C interface. The lack of ability to see the website means I can’t pursue the EEPROM board any further, but a guess is that it offers the facility to swap code between users. 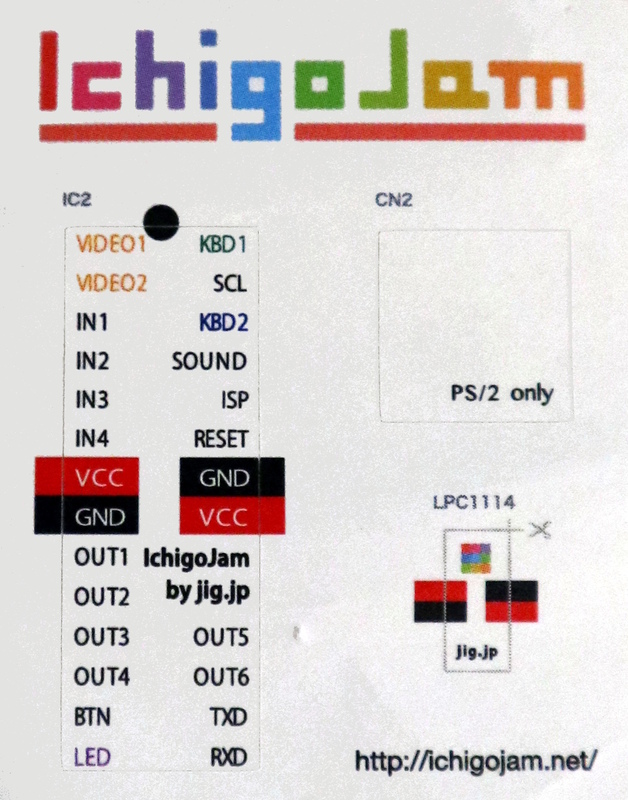 The IchigoJam’s supplied sticker has all the I/O pin assignments. To those interfaces then. The IchigoJam sports three single-in-line 0.1″ pitch sockets, two of which replicate directly the pins of the LPC1114 and one of which provides I²C as well as 5V and 3.3V rails. Onboard are a single button and an LED each connected to their own GPIO lines. Four of the remaining GPIO lines are configured as inputs while six are outputs, and there are also a pair of lines configured as a serial port. All pin configurations are clearly marked upon the board, or with the pin assignment sticker if the builder has chosen to use it. Programming these hardware functions is easy enough, through BASIC keywords for each one. For those of you who had to use PEEK and POKE to access hardware mapped to memory locations in the 8-bit days, this offers unheard-of convenience. LED and BTN are the “Hello World” of IchigoJam hardware because they require no extra wiring, but the rest of the lines are not left behind with both IN and OUT keywords. Analogue functions are not forgotten either, an ANA keyword reads voltages on input pins while PWM as its name suggests provides a PWM output capability. A bit of fun with some LEDs and wires confirmed the potential in these functions. Then there is that I²C interface, something which I think sets this at the same table as some of the more accomplished boards. Suddenly we’ve moved on from having a fun retrocomputer or a board for kids with a few GPIOs, this interface opens up the IchigoJam to a huge range of devices and breakout boards through the simplest possible of programming. An I2CR and an I2CW command both allow any device to be read and commanded from within BASIC. 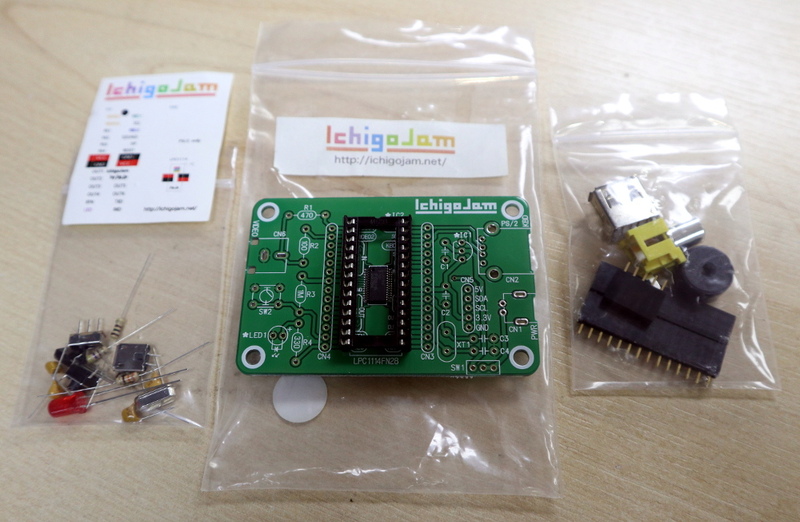 The IchigoJam then is a very simple yet surprisingly capable board from Japan that obviously provides its intended purpose of giving Japanese kids a taste of coding. It’s never going to displace the boards you’re used to, but it should appeal to anyone who appreciates the old 8-bit BASIC machines. It will also have use for anyone who wants a simple but versatile easy-to-program microcontroller board. The use of analogue video and PS/2 capable USB keyboards indicates that it could perhaps use an update of some kind on those interfaces, but neither of those is an unsurmountable issue. I rather like it, and will be sorry when the time comes to hand the review model back to its owner. Can it read the Hackaday Retro Edition? The MixJuice WiFi card, one of several add-ons for the board. During the research for this article I happened to mention the IchigoJam on Twitter and was contacted by its originator, Taisuke Fukuno. He pointed me to his write-up of its appearance at Maker Faire Bay Area in 2017, but for now these remain Japanese market only products. There seems little prospect of them emerging in the American or European stores you’d expect such as Adafruit or Pimoroni, and to me that’s a crying shame, because while it might lack the power of a Raspberry Pi or the versatility of an Arduino it’s still a pretty cool board. I appreciate only too well that the support liability for offering a kit internationally is a heavy one for a small company, so it’s possible we’ll never officially see it on our side of the planet. Still, if your travels take you to Japan try to pick one up. You won’t be disappointed. The ZX Spectrum and C-64 could be used for hardware experiments but they were an expensive piece of kit back in the day. I would never have dared to fry my Spectrum. There is the firmware (PAL and NTSC versions) and even the Gerber files for the PCB. They are generated using a EDA package Sprint-6.0 – never heard of that one. But now I am tempted to reverse-engineer the schematic in KiCAD. Everything is available to clone the boards. It seems to be under a CC-BY-4.0 licence, so that would be not only possible, but even legal. The only thing missing is the source code for the firmware. Or maybe somebody who can read japanese can find it? Unfortunately, this firmware is not published in source code at all. It is binary only. I just had a look as we use Sprint at work. Unfortunately it will only export to gerber. What’s there to order? IT’s just a fairly low-powered ARM MCU with BASIC on board. I’m sure there’s BASIC available for ARM chips that aren’t so limited as this one. I loved my various 8-bit computers as a kid, but they all had colour graphics (even the Spectrum!) and some sort of sound chip (except the Spectrum, but except except the Spectrum 128 / +2 / +3!). This looks a bit crap. Once you’ve got your LED blinking, what do you do? Knowing myself as a kid, I’d be annoyed by how limited it is. For the same sort of money there’s so many better options available. Is there some foundation or something behind these? Some fad? Were I still a kid I might like this, if it had an LCD display and a joypad and couple of buttons. 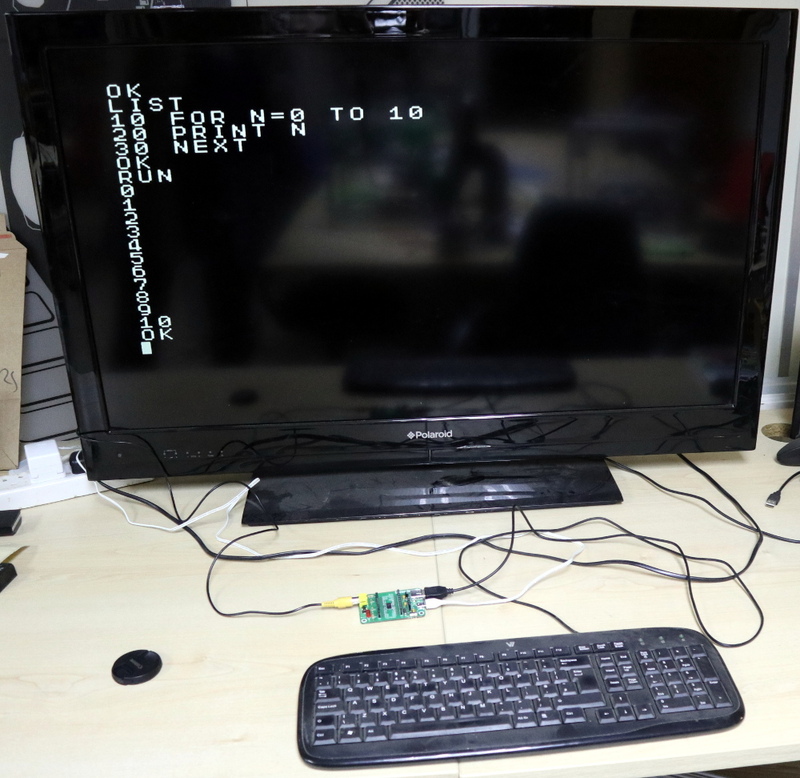 To program on TV but use the LCD for playing the games I’d write. I can’t even see Japanese kids having this as a fad, and they’ll have ANYTHING as a fad! Are you sure people are buying these? There’s been stuff like this available for years in the West, and they haven’t been immensely popular. I think my go-to for this sort of thing would be a board that supports MicroPython. You can get a Python ‘REPL’ terminal and everything. It’s still cool to see more ‘basic computing’ projects, though. Anything that gets people closer to the metal, right? Comparing this MCU-board to the RPi is an apples-to-oranges false equivalence! Arduino is a more appropriate match. Does this BASIC have immediate mode though? Immediate mode I2C could be quite useful if you don’t already have a Bus Pirate or similar. For “Immediate mode I2C”, please do a little more detail what you are asking for. “Immediate mode” in BASIC, is executing commands as soon as they’re entered. EG, type “PRINT 2 * 4” will result in the computer printing “8”. If you’d typed “10 PRINT 2 * 4” then you would have to type “RUN” to see the result. But typing it with no line number, means it executes straight away, immediately. That’s “immediate mode”. Neil was saying that to be able to use the I2C commands in this mode, straight away, without having to enter a program, would be helpful. You’d be able to send and receive I2C interactively. This might be handy when debugging a circuit that has I2C. I don’t know, but I suspect this BASIC does have immediate mode, because I never heard of a BASIC that doesn’t. Perhaps a BASIC compiler wouldn’t, but any BASIC interpreter would. Yes, IchigoJam BASIC can use direct mode! “Direct mode, also known as immediate mode”. Either is correct and “immediate mode” has been used for a long time, certainly during BASIC’s heyday, the 1980s. Myself and Neil both used it here. I grew up writing BASIC programs for fun. I know many Japanese home computers included BASIC too, so perhaps you did yourself. It’s easy to be right after someone’s given you the answer. You went from not knowing what “immediate mode” meant, to correcting me on it’s proper usage, after I’d explained it’s meaning to you. It’s an entirely appropriate match in the context I was doing it, they both fill the same niche of bringing coding to kids. Obviously hardware and OS wise they’re chalk and cheese, but oddly enough in their core market they do the same thing. Remember we aren’t the intended market for the Raspberry Pi. Funny, looks similar to the old Parallax Propeller Demo board that had 2 P/S2, VGA, and Composite out. Nowadays, you can program the Propeller with PropBASIC or C, so you could do much of the same. Sadly still gives me a 403 forbidden here in the UK. That site is well accessible from Switzerland here. Shall I now tell the brits to hurry up with yer Brexit and step out of Europe? I mean, we don’t even have a Channel here in .ch …. Maybe they are sick of all those damn cookie popups. If I were actively adding content to my site I might consider blocking Europe in protest! No problems accessing it in the Netherlands. Hi! I’m developer of IchigoJam. A 8 bit computer MSX grew up me. Do you provide source code for the project ? It’s a neat piece of kit. They offer a Raspberry Pi distro that has the basic operating system on it in. The Japanese Ministry of Education has started a push to teach elementary school kids “basic programming skills”. This is definitely a cheap way to teach them BASIC, anyway, and the website shows quite a lot of input from children. The latest version of the board seems to contain a footprint for the SMD part, so the lack of a DIP version is no longer a concern. The Gerber files are be available under a CC 4.0 Attribution International license. Is exposing kids to BASIC these days really doing them any favors? I’m not trying to be mean or anything I am only trying to start the conversation. It’s been about 30 years since I first started programming and yes, it was in BASIC. At this point it might be hard for me to relate to a beginner. Still, I wonder if starting with a more modern language, perhaps Python wouidn’t be equally beginner friendly. Any thoughts from people who more recently were beginners? Line numbers, GOTOs and GOSUBs are fairly removed from today’s classes and method calls. I wonder if any advantage BASIC might offer in being easier to learn might be more than offset by how much must be un-learned when switching to something more modern and practical. It’s very common to teach introductory languages to kids. Whenever switching to a new language, some things must be unlearned or relearned. But the general way of thinking (data structures, program flow, function calls) usually builds on lessons across all languages. Basic is simple but you can still do some neat things with it. Everyone should give it a try at some point! I may have been the one that convinced Jim to buy it (?) I remember giving someone a tour this summer and introducing it. Did he tell you about the “ltrading card” box with some manga art on the outside, and inside is a sheet or card with a code program on it.? Also, I gotta say, the quality of books here in support of it are really good. There is a good variety of variants including a rocket ship or Christmas tree shaped PCB (IIRC). The BASIC doesn’t seem to have floating point and string functions. It’s not at all competitive with MS/GW or ZX BASIC or MicroPython. It’s a smart idea to connect USB keyboards as PS/2 to have less code, but how many USB keyboards support PS/2 today? Is this a color computer? Initial IchigoJam adopt PS/2. It was later changed to USB.